Well, it's that time again. I know you mommies know what I'm talking about. I LOVE Summer, really I do... I love spending time with Tater before he goes back to school, especially since I will barely see him once school starts back, now that I am working nights. Oh My God, Summer is so damn long! We have long ago worn out all the fun things we had to do: sprinkler, sandbox, pool, park, playing in the yard, trampoline, walks, etc... It's all old news now. I can tell that both of my boys, even the little one, are super bored and in dire need of entertainment. Well, the sweeties at Hasbro Toys must have read my mind, because on the crappiest, rainiest day of the Summer, a gigantic box showed up on my porch. Little did I know that inside it, would be our Summer saving grace! Opening that box was the most fun I have seen my boys have all summer long! The first thing they pulled out, I must say, has been there absolute favorite! 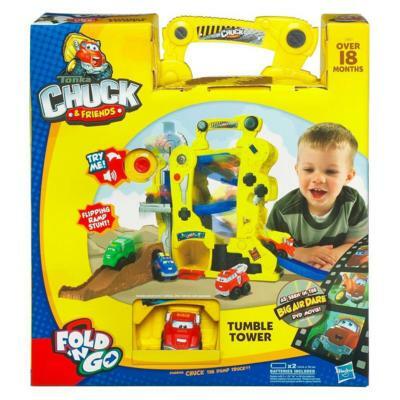 This is the Chuck & Friends Fold 'N Go Tumble Tower Play Set! It is recommended for ages 18 months and up. I really was unsure about how much the boys would like this, since Bean is only one and Tater is 5, but let me just say WOW! They haven't put this toy down in like a week! Really, one of them always has it! This toy is made to be used with the smaller Chuck & Friends trucks, which was perfect for Bean because he got the whole set for Christmas last year! Even if you don't have the smaller trucks, don't worry because it comes with one vehicle! The Fold 'N Go Tumble Tower Playset is really cute! "Rev up your engine for tons of tumbling fun! Set your CHUCK THE DUMP TRUCK vehicle at the top of this tower to watch him tumble down the moving ramp and come speeding out the side. Then, put him on the lift to send him up to the top to do it all over again! When you and your vehicle pal really want to put your “driving skills” to the test, send him down the ramp to do his flipping ramp stunt. When playtime’s over, park your CHUCK THE DUMP TRUCK vehicle inside the playset and fold it up, so you’re all set for on-the-go stunt fun!" Look how tiny it folds up!! We have absolutely NO space around here, and any toy that doesn't take up tons of space is a friend of mine! I couldn't believe that it fit in the tiny space in between their bookshelf and the wall! Thanks again Hasbro! I actually had to remind the boys that there were more things in the box from Hasbro, since they were obsessed with Chuck! But, when my little Bean actually got the chance to play with the PLAYSKOOL Wheel Pals Animal Tracks Splash 'n Bath Playset, he was thrilled! You see, my little Bean HATES a bath. I am not sure why, but he always has... So anything to take his mind off the actual act of taking a bath, is a winner! This little toy is so cute! 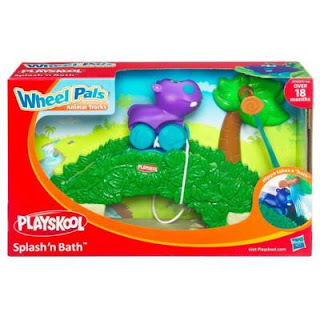 "When this WHEEL PALS hippo vehicle is ready to “wash up,” nothing will stop him! 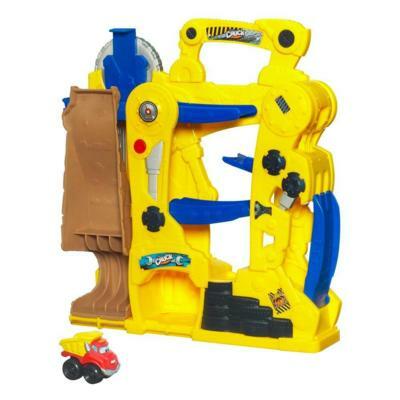 Your child can set the vehicle up at the end of this river-themed playset and then lift the launcher to start him racing. 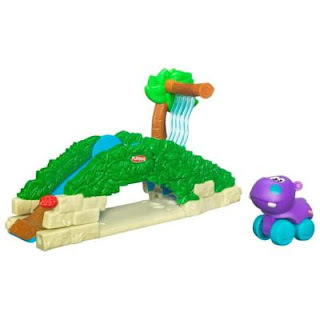 As the hippo zips up and down the hill, he takes a “bath” in the “waterfall”! The fun just keeps rolling every time your child lifts the launcher!" 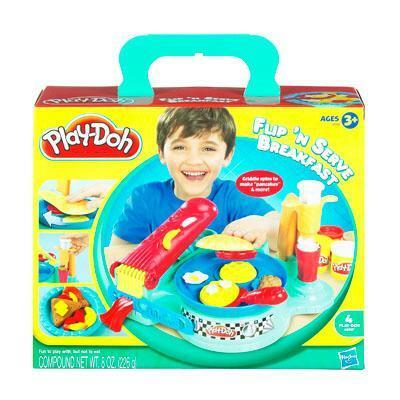 But, mommy's favorite product from Hasbro will always be Play-Doh. I just love Play-Doh. It is one toy that hasn't changed a bit since I was a kid, and playing Play-Doh with the boys makes me feel like a kid again! But, I must say, Play-Doh playsets sure have come a long way since I was a kid! Wait until you see the awesome Play-Doh sets Hasbro was kind enough to send us! 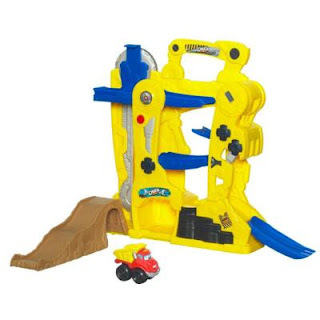 We have had so much fun with this playset! Tater was thrilled that you can use it to make a smoothie, his most favorite thing in the world! My favorite parts were "making eggs" and "waffles"! I really love toys like Play-Doh SO much because it really allows my kids to be creative. I love seeing what they will come up with next, you just never know! "Whip up some delicious fun with this breakfast set! Use the molds and “griddle” to create scrumptious looking “eggs”, “pancakes” and much more out of PLAY-DOH modeling compound. Then, use the waffle griddle to press out a picture-perfect “waffle”. Would you like a “banana” or a “croissant” to go with your “French toast” or “hash browns”? But of course! A knife, spatula and fork even let you “serve up” your creations. When you’re done “cooking”, just put everything back inside the container to keep it all safe and sound for your next imaginative “breakfast” or “brunch”!" We were also lucky enough to receive another Play-Doh Playset! We got the Sesame Street Cookie Monster's Letter Lunch Playset and it is adorable! Learning is fun with PLAY-DOH compound and Sesame Street. This playset helps children learn their ABCs. They can shape letters to spell out their names and other words! 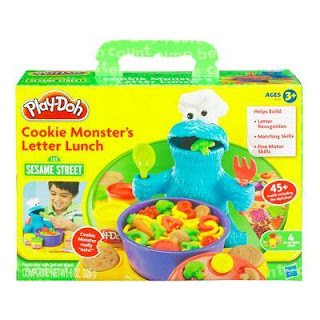 Kids can even make a pretend alphabet soup and “feed” it to Cookie Monster for “lunch!” Includes 4 cans of PLAY-DOH compound. 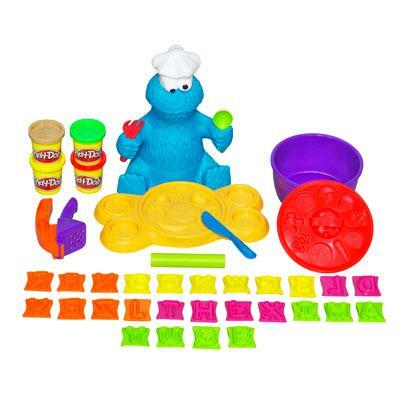 Set includes Cookie Monster character playset with bowl, lid, knife, spoon, fork, roller, more than 45 molds, presser tool, playmat and 4 two-ounce cans of PLAY-DOH modeling compound. All I can say about this one is, it was PERFECT! It says it is for ages 3 and up, and my Tater just turned 5, so I was afraid this might be a bit babyish for him... But, it is perfect! He is just now learning to spell words and work on reading, and he spent a good hour and a half making letters and spelling words! I am always loving any toy that helps my kids to learn while they are having fun! And if they don't even realize they are learning, that's even better! This was absolutely the perfect toy for my big guy! I would like to say a big thank you to the folks at Hasbro Toys! You guys knew just what we needed to end our "end of Summer" blues! My boys now have a bunch of new toys in their arsenal, and *hopefully* we will stay entertained until it's time for school! Now, it's your turn! Hasbro is giving away a prize pack with the same four toys that I reviewed to a lucky Flip Out Mama reader! Yay!!! Go here to Hasbro's website, and tell me another item they make that you would like to own! +1 Sign up for Shop It To Me here! +1 extra entry PER DAY! Tweet about this giveaway, or post it on your Facebook, or blog about it! Don't forget to leave a link to this post, and then comment here with a link to where you posted! This lovely giveaway will end on 7/31/2011 at approx 11:59 pm. Winner will be chosen via random.org and will have 48 hours to claim their prize or an alternate winner will be chosen. Fulfillment of prizes is responsibility of sponsoring company.Open to US residents only. disclosure: I received the above mentioned product in order to conduct a review. All opinions are my own and no monetary compensation was received. i love their Nerf products! I love this review! My son loves the Chuck & friends sets, and my daughter loves Play Doh- we are Hasbro people here too lol. I looked at their website & I would like to get the Guess Who? Disney Edition. I didn't even know they made that, Disney products are good in my house too. love the tonka light and sound vehicles!!! 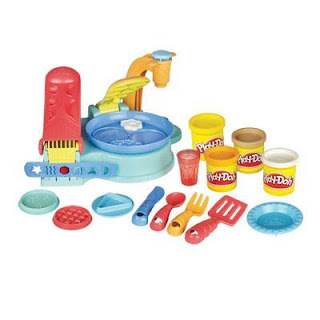 The PLAY-DOH Animal Activities Mini Bucket would be perfect for my nephew...thanks! The PLAYSKOOL POPPIN PARK ELEFUN BUSY BALL POPPER looks fun too! I Follow Hasbro's Twitter- hisprincess886. 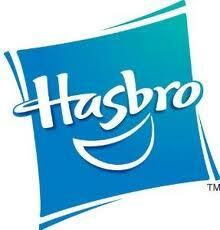 I Follow Hasbro's Facebook page- emillie rose. I shared on twitter - http://twitter.com/#!/HisPrincess886/status/96698244821823488. I also like the U-BUILD - MONOPOLY Game on the Hasbro site. I would love to have the Star Wars Force Tech Darth Maul electronic helmet. Back To School Shopping With Crocs! PlasmaCar: Kid Power is The BEST Power! Whose Blog Is It, Anyway? Happy Meal Re-Vamp? Whaddya Think? Bright Starts Grab 'N Stack Blocks Review! Review: Adorable Artwork from Easy Canvas Prints! Seeking Sponsors for Our Back To School Event! Fun In The Sun! i play. review & GIVEAWAY!